Markelle Fultz hasn’t played for the Sixers for almost a month, as he recovers from something called thoracic outlet syndrome and attempts to rebuild his broken confidence and broken jump shot. 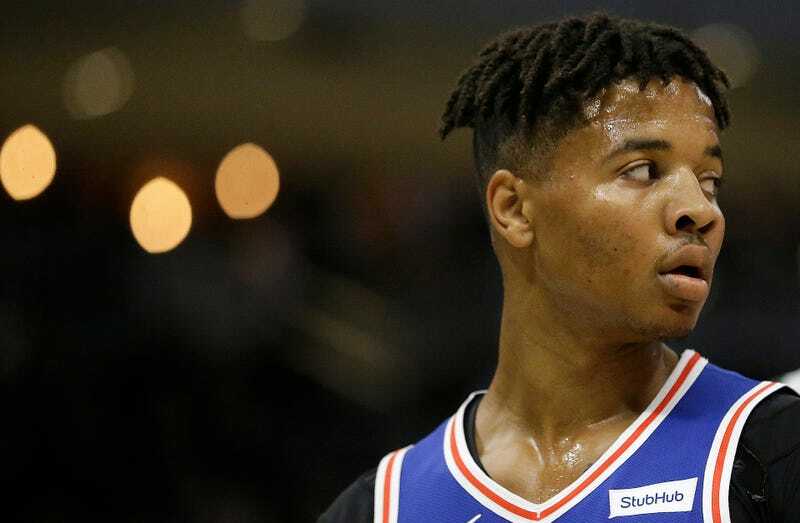 Teams are reportedly calling the Sixers with lowball offers, and now that he’s spending his second season the same way as his first—out with a mysterious and depressing injury—it’s an open question whether Fultz will ever play for Philly again. Candace Buckner of the Washington Posts has a revealing story out today about where Fultz stands, and how he got here. Like any story on Fultz, it’s concerned primarily with how odd things have gotten for the first pick of the 2017 NBA Draft, though Buckner goes further and gets into how Fultz’s inner circle has managed and shaped his strange NBA journey. For example, Buckner reports that many in the Sixers organization didn’t even know that Fultz would miss time to see shoulder specialists until his agent and attorney Raymond Brothers tweeted about it. The first person to try and fix Fultz’s shot after he was drafted was Keith Williams, a trainer who Fultz described as a mentor and father figure. Williams said he noticed something wrong with Fultz’s form between the draft and his first minicamp, and Williams has been blamed for “ruining” Fultz’s shot with his attempts to fix it. Williams is still close to Fultz, and he apparently negotiated Fultz’s first endorsement deals, though he says he’s been pushed out as Brothers and Fultz’s mother Ebony have taken over. “Everybody mishandled all of his relationships,” Williams told the Post. Given the immense pressure Markelle Fultz is under, the pattern of nobody ever really seeming to know what’s going on with him, and the intense management team he has, he seems like he could just be burnt out more than anything, as if he might not actually enjoy playing basketball all that much. The Sixers talk effusively about what a good person and teammate he is, but this point, I just hope he gets the space to become his own player.